I can’t remember ever in my entire life getting to say this, but holy heck there is a lot of crap happening in April! My inbox has got all kinds of stuff showing up in it, not to mention my father’s birthday is this month too! First off is a great educational opportunity from The Pluralism Project at Harvard University that doesn’t require you to live or move to the area. The application deadline is April 23rd. The Pluralism Project is seeking applications for research internship positions for summer 2013. Interns will conduct research on the growing religious diversity of cities across the United States. This “hometown research” opportunity can be conducted wherever applicants are located and will include field visits to religious centers, ethnographic interviews, and weekly intern cohort meetings via Skype. Research projects may be published in the forthcoming online version of the Pluralism Project’s On Common Ground: World Religions in America. Applications are sought from current undergraduate and graduate students with excellent writing and oral communication skills. Experience in conducting ethnographic field research a plus but not required. Interest in (and respect for) diverse religious communities is a must. Internships are unpaid, although we are happy to work with candidates to secure academic credit or internship compensation through their home institution. Please send a letter of interest and a current resume/CV to staff@pluralism.org, attn: Whittney Barth, Assistant Director. Application deadline is April 23rd, although decisions will be made on a rolling basis. Internship start and completion dates are flexible and will be determined in consultation with the cohort, generally late May through early August. Since 1991 the Pluralism Project at Harvard University, under the direction of Dr. Diana Eck, has been researching the changing religious landscape of America. The Pluralism Project’s mission to help Americans engage with the realities of religious diversity through research, outreach, and the active dissemination of resources. Learn more at pluralism.org. Are you like me and say that silly line about how you’ll only run when chased? A press release showed up in my inbox that may be just the kind of run for you! The Zombie Run, a 3.1 mile racecourse of gut-wrenching, blood-pumping, sweat-dripping fear, will soon be mounting a 16-city nationwide infestation, for the most exhilarating 5K of your life… if you survive. The 2013 tour kicks off April 7 in Philadelphia, where it was created, and by the fall also will overrun the streets of Chicago, New York, Miami, New Orleans, Seattle, Denver, Indianapolis, St. Louis, and many other U.S. cities. Complete schedule is below. For the latest information, including early registration deadlines, go to www.thezombierun.com. The Zombie Run is not your typical hometown 5K run, unless of course, your hometown is infested with an army of marauding Zombies. By using the popular Zombie theme, The Zombie Run creates a running narrative on a racecourse designed like a Hollywood Apocalypse movie-set – complete with helicopters flying overhead – where participants either run through the course as Zombies, or living Zombie prey. Participants must run to safety, while dodging an imaginatively harrowing barrage of apocalyptic carnage. The Zombie Run is the only nationally touring Zombie race that takes over the actual streets of each city, and focuses on a fully scripted, suspense-filled back story. Professional, on-site make-up artists transform normal, everyday, warm-blooded runners into blood sucking, flesh eating Zombies. If you survive, there is a party following the race. The Zombie Run benefits Active Heroes (www.activeheroes.org), a volunteer-led charity helping veterans, active duty military and their families. A portion of proceeds from each event also will be donated to a local charity. For The Zombie Run event tickets and information updates, visit www.thezombierun.com. The MOVE Music Festival is an ILMG and Avid Entertainment production. The festival will consist of approximately 100 acts performing at venues across Albany, New York on April 26-27, 2013. The main purpose of this event is to give exposure to regional talent through live performances at select venues and provide musicians with insight on how to conduct their careers in today’s independent music scene. In addition to the music showcases, MOVE will be holding a merchandise trade show and interactive round table sessions with industry professionals at the Hotel Albany lodging and convention complex in downtown Albany. The interactive round table sessions will give Move artists an intimate opportunity to connect with various companies that will provide vital information, creative solutions and online strategies regarding the development, management and progression of their music careers. By discussing current digital business models, artists will get a number of diverse perspectives on how to advance their musical endeavors and discover new ways to attain sustainability, reach more fans, book shows, promote their music and market their brand. Visit movemusicfest.com to learn more. 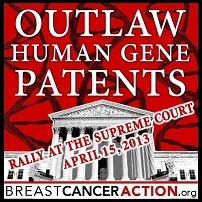 Also, on April 15th my heroes at Breast Cancer Action, the ACLU, and the Public Patent Foundation will be giving oral arguments to the Supreme Court of the United States on behalf of more than twenty plaintiffs against Myriad and the U.S. Patent and Trademark Office, challenging claims on Myriad’s patents and on the right of any company to patent gene sequences. Breast Cancer Action will be holding a rally at the Supreme Court that day. If you live in the Washington D.C. area or are interested in traveling there to attend the rally, check in at www.bcaction.org/genepatentrally for more info. Previous postDoes American Dad Reflect America?